Raiders of the Lost Ark just extended a one week run in IMAX theaters, and AMC Theatres are still having a marathon of all the Indiana Jones adventures tomorrow, and even more classic movies are headed back to the big screen this fall. Just in time for the spooky holiday, John Carpenter's original 1978 horror film Halloween is coming back for a limited theatrical run starting October 25th. 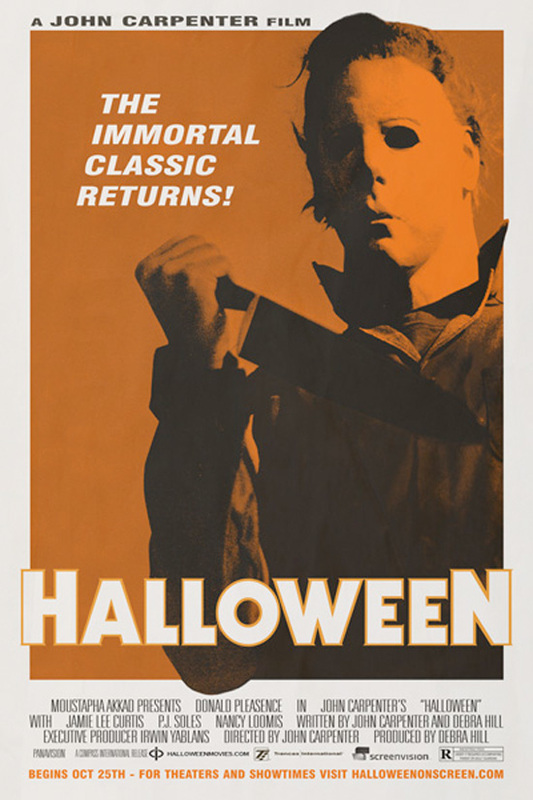 Strangely enough, I've seen the sequel Halloween II in theaters at the New Beverly in Los Angeles, but I've yet to see the original on the big screen, so this sounds like a great Halloween plan for cinephiles like myself and horror fans alike, right? The news comes from Halloween Movies (or rather their Facebook page, via Dread Central), complete with the above poster that says the film will return to theaters starting on Thursday, October 25th, likely giving it at least a one week run leading up to Halloween the next week. No theater listing is available yet, but Screen Vision is apparently the place to keep an eye on for theater listings. We'll do our best to update this post when the theaters are revealed now through September 28th. Seeing Jamie Lee Curtis and The Shape who came to be known as Michael Myers back in theaters should be the best Halloween treat this year. Cool? Hopefully this will show "the kids" what a true horror movie is supposed to be. they may not know how to respond. i doubt many have seen a horror film as good as this one. 20 bucks says it doesn't come anywhere near me. But if it does, oh boy! Cool, Michael Myers back in theaters! will it be digitally remastered?